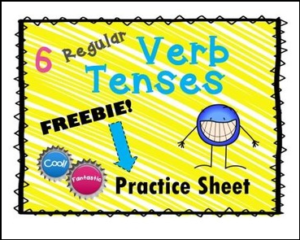 Give your students some repetition with the 6 English Regular Verb Tenses Practice Sheet! Thanks for browsing my resource! All TPT Sellers have my permission to use this FREE product on their blogs or wherever else they may display FREE products. You may not sell my products, however. Write a review of this product after your purchase to earn FREE TPT credits to use for future TPT purchases!